We had such a great Halloween this year because we dressed up as a family with our own homemade Halloween costumes. 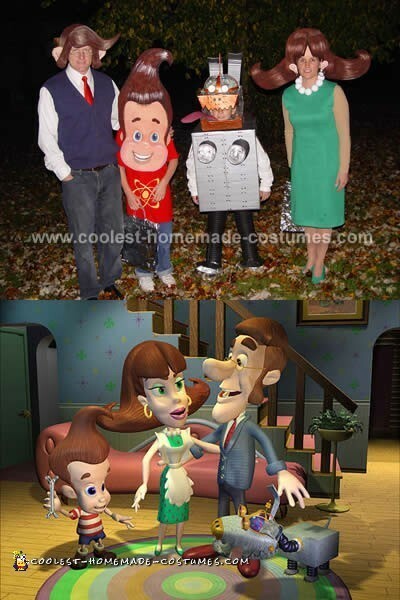 We complimented my son’s Jimmy Neutron costume by having my other son dress like Goddard the Dog and then my husband and I dress as Jimmy’s parents, Hugh and Judy Neutron. It was so much fun and totally worth the time it took to make these homemade Halloween costumes because we have some really great memories. 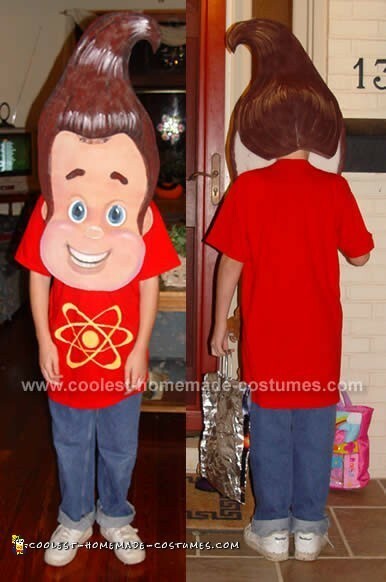 For my 11 year old son’s Jimmy Neutron costume I started with a yard of craft foam from the local fabric store. It is about 1/2" thick and was an ivory color. I looked at my son and decided that to have Jimmy’s proportions look correct we needed to have Jimmy’s head lower over his body. His eyes needed to be at the bottom of his hair line and his chin needed to be at his chest. So I just drew Jimmy’s head shape and cut it out with scissors. It could not have been easier. I used two pieces of foam on the front to get some dimension to his face and I used one piece on the back to make a pocket for his head to slip into. His hair is one piece and his face is another. I painted the face with flesh colored fabric paint, painted his eyes and mouth and cut out additional pieces to apply for the nose and the eyebrows. It looked so cute. For his hair I spray painted it with brown paint and then added white for some accents. It was really easy. 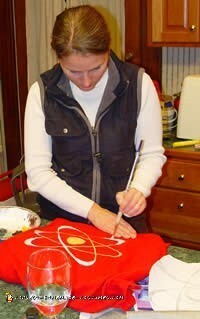 I put him in a long red shirt to accentuate the proportions and painted the yellow atom symbol on his shirt. He put on his jeans and tennis shoes and he was ready to go. My 9 year old son wanted to be Jimmy Neutron’s Dog "Goddard" for Halloween. He loves dogs and really wanted to be him and I had a lot of fun trying to recreate him. This was the most time consuming project of our Neturon family homemade Hallowen costumes, but it was worth every minute. 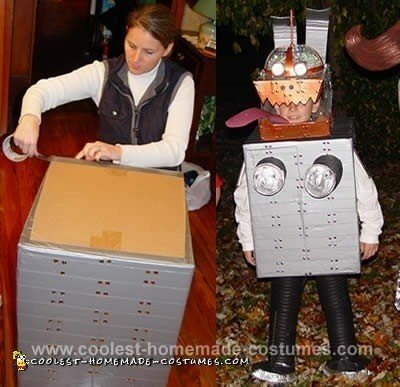 To make this costume I started with two cardboard boxes, (one large one to cover my son’s torso and one elongated for the head). I also used two rolls of 60 yd duck tape and 600 silver tacks, two light bulbs, plastic bowl, a screw, nuts and bolts, four metal cake pans, and some black plastic piping. 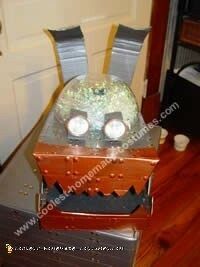 Then I covered the head with duct tape and cut out triangles to look like teeth and painted his nose copper color. I attached two broken light bulbs from our track lighting for his eyes. For his brain, I used a plastic bowl with iridescent streamers to look like his brain matter and then added a screw and nuts and bolts through the top to make his antenna, I also painted it copper. To finish off Goddard’s head I cut two pieces of cardboard and shaped it to make the ears and then covered it with duct tape as well and then cut a piece of pink plastic to make his tongue. It was really cute. For his legs and arms I used some black plastic piping and cut it in small sections and wrapped it around his legs so he could bend them and added two out the front. We cut slits in the side of the box so he could have his arms out if he wanted. For the final touch I used the four metal cake pans and put them over his shoes and on his fake arms. This was a fun costume to put together, just like the other Neutron family homemade Halloween costumes. To make it, I started with a yard of craft foam from the local fabric store. It is about 1/2" thick and was an ivory color. I first cut out Hugh’s swoop on his hair and then added the side burns and then those funny ears. For the back I just made a form for his head so he could wear it really easy. I spray painted it brown and added the highlights to give it some dimension. It was really awesome. I put him in his jeans and a white shirt and bought him a red tie and those fabulous glasses. To make Judy’s costume I started with two yards of craft foam from the local fabric store. It is about 1/2" thick and was an ivory color. I first made a template out of paper because her hair is so wide. I altered it a few times to make sure it was the perfect size and then I cut it out of foam. I cut two pieces, a full one in the back and I cut out the face and bangs on the front piece. I also cut two small extra pieces of bangs and glued them on to give it some thickness. I spray painted it brown and my mom helped add the highlights to give it some dimension. It turned out really great and was really easy to wear. I also added some ears on me, HA HA HA. And I added some gold hoop earrings to them to match Judy’s. For my beautiful necklace I used medium-sized plastic ornaments and spray painted them white. I cut off the tips for hanging and poked a hole through the other end and strung them together like giant pearls. It turned out really great. My dress was purchased at the Salvation army for a very small amount and I needed to add some darts to make it look more tailored, It originally had sleeves on it and I took them off and used the extra to cover a pair of shoes so that they matched the dress. It was all very easy. I had so much fun making these homemade Halloween costumes and we all had such a great time together! I hope you have a fun time looking at our whole family’s homemade Halloween costumes and good luck with your own homemade Halloween costumes!